NEW YORK, NEW YORK – August 30, 2018 – GameChange Solar announced today that Brad Sherman will be joining as Director of Business Development. Brad brings over 10 years of experience in renewable energy and sales management. Previously, as Senior Key Account Manager at Yaskawa-Solectria Solar, Brad managed the company’s growing customer base in the US establishing strategic relationships in the Northeast and Midwest with leading EPC’s, developers, distributors and financiers. Based in Boston, MA, Brad will deliver the highest levels of customer satisfaction for GameChange Solar, leveraging his broad industry network and track record of success in the region. 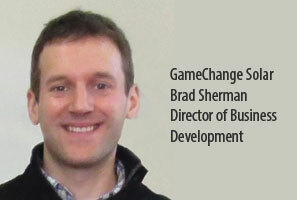 Derick Botha, Sr VP of Business Development at GameChange Solar, stated: “ We are excited to have Brad join our team. He is a well respected and seasoned professional in the industry. His attention to detail and commitment to exceed customer expectations will be instrumental in supporting sales growth at GameChange Solar and further our mission to repower the planet."